More than 9,500 of trade name and generic chemicals used worldwide in the manufacture and processing of foods. 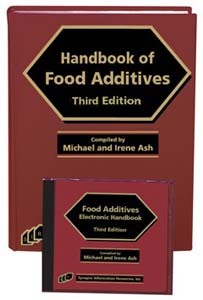 The Handbook of Food Additives, Third Edition has been extensively updated and expanded in this new edition. It describes more than 5500 trade names, and more than 4000 generic chemicals and materials, available from worldwide manufacturers, that function as direct additives in food that is available for consumption. Food additives are used to: (1) maintain or improve the overall nutritional quality of the food, (2) preserve the quality and shelf life of the food, and (3) make the food more appealing to the consumer through modification of taste, texture and appearance. These are intentionally added to a food to affect its overall quality. Substances reasonably expected to become a part of the food in trace amounts as a result of any aspect of production, processing, storage, or packaging are also included. Entries in this reference for both trade names and chemicals contain extensive information that comprehensively profiles each product. This reference is unique in that it functions as a single source for information on both the trade name products and the chemicals that are used as food additives throughout the world. It includes summaries of regulatory information for the United States, Europe, and Japan. The products described in this Handbook are cross referenced in multiple ways: chemical composition, function/application, CAS number, EINECS number, FEMA number, and E/INS numbers, and US CFR regulatory numbers. Trade Name Reference contains alphabetical entries of trade name food additive products. Each entry provides information on its manufacturer, chemical composition, CAS, EINECS, and FEMA identifying numbers, general properties, applications and functions, toxicology, compliance, and regulatory information as provided by the manufacturer and other sources. Chemical Component Cross-Reference contains an alphabetical listing of more than 4000 food chemicals and materials. Each food chemical entry includes, wherever possible, its synonyms, CAS number, EINECS number, FEMA number, INS number, E number, formula, chemical properties, function and application, toxicology, precautions, usage level, and regulatory information, as well as the manufacturers of the chemicals/materials. The trade name products from Part I that are equivalent to the chemical or contain that chemical compound as the trade name product’s major chemical constituent are cross referenced. Synonyms for these chemical entries are comprehensively cross referenced back to the main entry. Keyword Indexes: Comprehensive Index, Trade Name X-Ref, Generic Chemical X-Ref, Manufacturers X-Ref, CAS X-Ref, EINECS/ELINCS X-Ref, FEMA number X-Ref, E number X-Ref, INS number X-Ref, FDA 21CFR X-Ref, Functional/Applications X-Ref., Toxicological X-Ref., Molecular Formula Dir. Functional/Application Cross-Reference is a powerful tool for locating the trade names and generic chemicals/materials based on their combined function and application. By searching on key words such as anticaking agent, texturizer, aerating agent within a food application area such as dairy products, frozen desserts, health foods, etc., the user is directed to the trade names and/or generic chemicals/materials that have that specific function and application. Manufacturers Directory contains detailed contact information for the more than 2700 worldwide manufacturers and their branches of trade name products and chemical components that are referenced in this handbook. Wherever possible, telephone, telefax, toll-free numbers, e-mail and internet addresses, and complete mailing addresses are included for each manufacturer. FEMA Number Index orders chemicals contained in this reference by these numbers (assigned by the Flavor and Extract Manufacturers Association). FDA Regulatory Number Index orders the trade names and chemicals by their FDA CFR regulation numbers (Software links each section with details on the Internet). E Number Table orders the chemicals by the European Union designation for food additives. INS Table orders the chemicals by an international numbering system prepared by the Codex Committee on Food Additives and Contaminants (CCFAC) for the purpose of providing a method for identifying food additives by number as an alternative to the declaration of the specific chemical name. It is based on the E number system. Japanese Regulations of Food Additives with Standards of Use lists use, usage level, and limitations placed on food additives. Glossary contains definitions of terminology associated with food additives and their application areas.